The Eco-system we live is very fragile with a large set of interrelated elements that mutually aspect each other. One small disturbance causes a chain of reactions that manifest in different forms. Hence, its of utmost importance that we as environmentally conscious citizens know that repercussions of our actions. 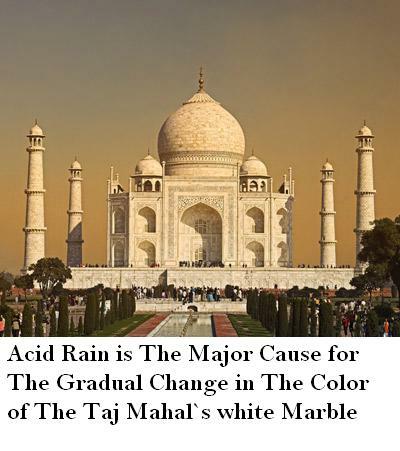 Acid rain is one such phenomenon that is a direct consequence of air pollution and causes a change in the chemical nature of rain water over a large area. Primary causes of an acid rain is the burning of fossil fuel such as coal, oil etc which release toxic gases such as sulfur and nitrogen oxides into the atmosphere. These gases tend to dissolve in the rain droplets in the cloud causing the rain water to become slightly acidic. Such rainfall causes damage to plants, soil, buildings, animals, marine life etc. Some other lesser known causes of acid rains are lightening which causes an oxidation of nitrogen in the air and also the soot emitted by active volcanoes. A primary result of an acid rain is the gradual corrosion of metals used in construction. Structures made of stones such as limestone, granite etc can also get eroded or lose their sheen and strength. It also effect marine life as sensitive species of fish cannot tolerate any change in the chemical nature of sea water which is majorly fed from rains. It also damages forests and causes changes in the soil which makes it very difficult for cultivating certain types of crops. The damage is more in regions located near mountains and in high altitudes. Acid rains are not generally specific to a particular region as the movement of clouds and storms carry clouds far away from the region which generates pollution. Also, the water table beneath the earth, the river systems which are largely interlinked do carry the acidic water across different geographies. The solution lies in gradually moving towards non-polluting ways of generating power and also reducing pollution and also treating the pollutants by filtering the acidic oxides before the gases are released into the air. Small steps we individually take towards such aspects can greatly help our environment before it becomes a largely impacted. Hence, its very essential for each of us to be aware of how we can all contribute in our own way to save our nature.